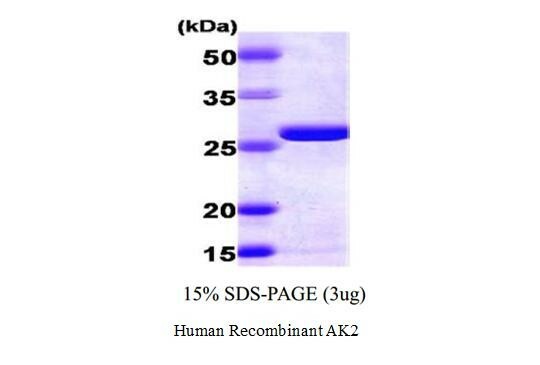 Human Recombinant AK2 | 6386 | BioVision, Inc.
1 mg/ml solution in 20 mM Tris-HCl buffer (pH 7.5) containing 5 mM DTT and 20% glycerol. Specific activity: > 1.5 units/ml. Adenylate kinase (AK; adenosine triphosphate-adenosine monophosphate [ATP-AMP] phosphotransferase) is a ubiquitous monomeric enzyme involved energy metabolism of prokaryotic and eukaryotic cells. 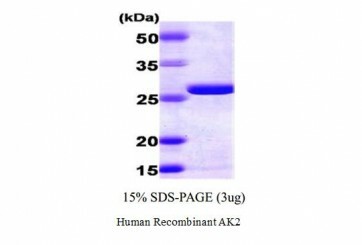 Three isozymes (AK1, AK2 and AK3) are characterized in vertebrates. Expression of these isozymes is tissue-specific and developmentally regulated. AK2 is localized in the mitochondrial intermembrane space and may play a role in apoptosis.